The views expressed in this publication are those of the authors and do not necessarily represent the views of the United Nations University. Edward Ploman, known to colleagues and friends as Eddi, served as the Vice-Rector of the Global Learning Division of the United Nations University from 1982 to 1986. 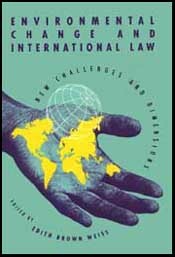 He was keenly interested in global environmental issues and in the role that international law could play. At the time of his death, he was a member of the group contributing to this book. The draft of his contribution to the book is contained in appendix A. The concept of "the common concern of mankind"